Uncle of Joseph Smith, Jr.
"Col. Stephen Mack, a soldier of the Revolution, an enterprising and industrious citizen, and a kind and provident father, departed this life last Saturday morning at Pontiac, in the seventy-second year of his age. Col. M. has for nearly twenty years resided in this territory, and has been distinguished from the mass of his fellow-citizens for his enterprise and the great utility of his views. It is owing to his exertions more than to any other man's, that the first settlers of Oakland County were so soon accommodated with mills and other useful works. His sacrifices and his exertions in promoting the best interests of the new county, which he had been so eminently useful in settling and organizing, endeared him to his fellow-citizens, and confiding in his excellent judgment in all matters connected with the welfare of a young community, they elected him to the first legislative council of the territory. His advanced age constantly warned him that he had but a short time to remain with us; yet he stayed not his labors, and death found him striving to accomplish objects of the most useful and permanent kind. The loss of such a man is truly that of the public -- and many are those who share the grief of the numerous family which he has left. " Col. Stephen Mack was born in Marlow, New Hampshire. He came to Michigan from Tunbridge, Vermont in 1810. In Detroit he was a partner in Emerson, Mack & Conant, which was the leading mercantile house in Detroit at that time; the firm was composed of Thomas Emerson, father of Curtis Emerson, Esq., of East Saginaw, Stephen Mack, and Shubael Conant; they kept a general assortment of dry goods, groceries, crockery, and hardware. Col. Mack served in the American army in Michigan during the War of 1812. Revolutionary War Service: Enlisted at age of sixteen in New Hampshire militia, as a private in Capt. John Trotter's company under Col. Rufus Putnam's sixth regiment; received rank of colonel in Vermont troops. Occupation: Director of Bank of Michigan, 1818; trustee of village of Detroit and supervisor 1816-1818. "By 1816, Stephen Mack had changed partners in his fur and trade business and was doing so well he decided to open an office in Chicago, four miles south of Fort Dearborn. Meanwhile he speculated land in Michigan and formed a coalition of land prospectors called the 'Pontiac Company.' These men would eventually plot and organize the city of Pontiac, Michigan." He was a member of the first Michigan Territorial Council, which met in Detroit in 1824. He was also the founder of Pontiac. He was the husband of Temperance Bond, who left Michigan to travel to Salt Lake City, Utah, where she died in 1856. Stephen Mack and his wife, Temperance Bond, were the parents of 12 children (including nine daughters and three sets of twins). His sister, Lucy Mack Smith, was the mother of the Mormon prophet, Joseph Smith. Sources: History of Oakland County, I, 75; Mass. Soldiers and Sailors in Revolution, X, 109; Mich. Hist. Colls., I, 24, 470; III, 223, 267, 570, 571, 574; IV, 190, 459; V, 540; VI, 385; XIII, 316. Stephen Mack was a merchant and politician. He was the brother of Lucy Mack Smith and so the uncle of The Latter-day Saint founder Joseph Smith, Jr..
"My son Stephen, in company with the cabin boys, was sent to a house, not far from the shore, with a wounded man...A woman was engaged in frying cakes at the time, and being somewhat alarmed, she concluded to retire into the cellar, saying, as she left, that the boys might have the cakes, as she was going below. The boys were highly delighted at this, and they went to work cooking and feasting upon the lady’s sweet cakes, while the artillery of the contending armies was thundering in their ears, dealing out death and destruction on every hand. At the head of this party of boys was Stephen Mack, my second son, a bold and fearless stripling of fourteen." Stephen served on this trip in March 1779, and then served in the American Army from July 25, 1779 until August 31, 1779 with his brother Jason. He reenlisted, still aged only 15, for three years; serving from April 2, 1781 into 1783. Mack settled in Tunbridge, Vermont where he established a store in town and a farm where he lived in the country. He had a son Stephen Mack, Jr. born 2 February 1798 in Tunbridge. Mack moved to Detroit, Michigan in either 1800 or 1807. He left his family behind in Vermont where the children could be better schooled and established a string of merchant and business ventures in Michigan. In Detroit during the War of 1812, he was given the captaincy of a company; however, the city was quickly surrendered to the British. Mack is said by his sister to have broken his sword over his knee and thrown it into the lake on hearing of the surrender. To save his property, his housekeeper housed British officers and pretended the house and business were her own. After the war, Mack brought his family to Michigan. They briefly lived in Detroit before settling in Pontiac, Michigan where Mack had a farm and a building firm as well as a sawmill and a flour mill. He is said to have at his own expense paid for the building of a road from Detroit to Pontiac. He also built a sawmill in Rochester, Michigan and had ventures in Ohio. He entered into a partnership which was known as Mack & Conan which remained in business until 1821 when it was bought out by its chief competitor the American Fur Company. In 1812 he became a trustee of the village of Detroit and later a director of the Bank of Michigan. He was referred to as Major by a neighbor and called Colonel in his obituary. He died after an illness of four days and left an estate of fifty thousand dollars. The major thoroughfare, Mack Avenue, in Detroit is named after him. On the banks of the Clinton River, at the southern edge of the emerging village of Rochester, Colonel Stephen Mack built a flouring mill in 1824. The settlement of Rochester was only seven years old at the time. 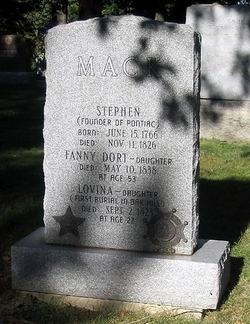 Mack, a native of Connecticut and veteran of the Revolutionary war, had migrated to the territory of Michigan in 1810 and lived in Detroit for a time before leading a group of investors who purchased land to plat the future city of Pontiac. After making his permanent home in Pontiac, he established the aforementioned flouring mill in Rochester. In 1857, Mack's old mill was converted to paper making, and seven years after that it was purchased by William H. Barnes. Barnes had been born in Connecticut and had worked in paper mills across New England and the mid-Atlantic before coming to Michigan in 1863. With his brothers, Cyrus and Charles, he operated a paper wholesale business in Detroit. In 1864, William H. Barnes moved to Rochester to operate the paper mill on behalf of the Barnes Brothers firm. The Barnes mill was very successful and was an important employer in Rochester for more than a century. The company took a hit in 1875, however, when a local woman named Ann Strong who had a grudge against William Barnes set fire to the mill early on a Sunday morning. The building burned to the ground and Barnes suffered a loss of approximately $32,000. He immediately rebuilt upon the old foundation a mill of brick and slate, and it is this building that is shown in the accompanying photograph. After the death of William Barnes in 1903, the paper mill operated under several different names and owners. It was for a time known as the Peninsular Paper Company, the Rochester Paper Company, and the James River Company. The paper mill is remembered as the only Rochester industry to operate continuously throughout the years of the Great Depression, offering much-needed jobs for local residents when other factories were shuttered. In April 2002, the paper company ceased operations, ending a 127-year run of paper making at the site. The property was sold for redevelopment, and in 2005 the old mill was razed; 161 years after Stephen Mack established the first mill at that location, the paper mill passed into the pages of Vanished Rochester. 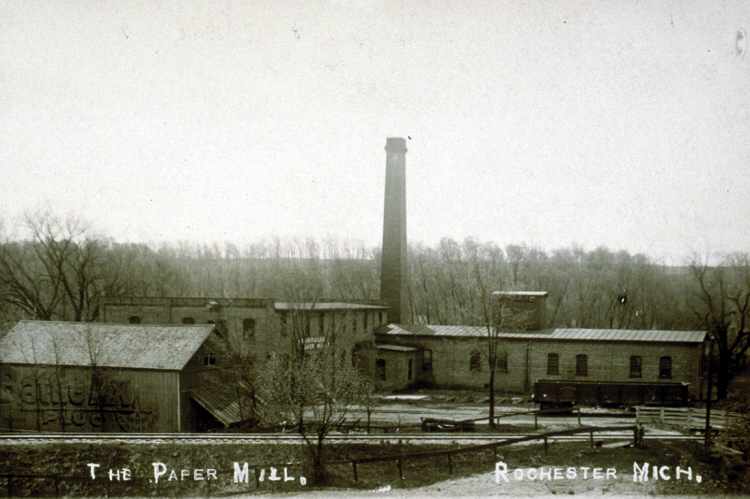 This postcard view from the collection of the Rochester Hills Public Library shows the paper mill as it looked about 1907. Hi Louise, This is very interesting to read! I just have one comment to add to this article. It says that Stephen Mack was the grandfather of Joseph Smith, jr. Actually, Stephen was the prophet's uncle and his father was Solomon Mack, Joseph Smith jrs grandfather. Thanks again for doing this!